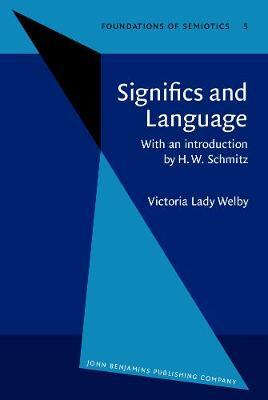 This is the facsimile 1911 reprint of Victoria Lady Welby's very last publication Significs and Language. The Articulate form of our Expressive and Interpretative resources. This volume also includes two major essays from the author's hands, `Meaning and Metaphor' (reprinted from The Monist 3:4, 1893), and `Sense, Meaning and Interpretation' (reprinted from Mind 5:17 and 18, 1896), and a selection of several noteworthy and unpublished essays. In the introduction to this volume the editor H. Walter Schmitz exemplifies how Lady Welby developed her significs in discussion and cooperation with numerous highly divergent scientists and scholars of her times; how her ideas influenced other scholars in Europe and the US; and how significs sank to near oblivion and was finally recovered.